You don’t have to drop thousands on a total porch remodel to infuse some new life into your front stoop. Wheater you are preparing your home to sell in the spring real estate market, or are just tired of your dull, undecorated front door area, these simple improvements can make a huge difference. These 9 tricks can help you make a great first impression and can all be accomplished in under two hours! Having a statement door has recently come back into fashion and is a great choice if you are looking for a bold way to revamp your entrance. Try painting your door a striking, complementary color that goes well with your siding and overall color scheme. Be sure to paint on a day when there is no chance of rain to avoid causing paint streaks. This simple improvement can really make your home pop and is an eye-catching feature for total curb appeal. If you have just painted your door, or prefer the natural wood look, give it a good cleaning to remove spiderwebs and debris and polish the metal accents. Invest in large, sturdy house numbers that can easily be seen from the road. Try to find numbers that match the hardware on your door to enhance the classy look and create a coherent decor style. You’ll be surprised at how modern your home looks with this simple improvement. When you can’t remember the last time you power washed away that built-up dirt and grime staining your front steps and sidewalk, it is probably long overdue. If you don’t have a power washer check home and garden stores such as Lowe’s or Home Depot for a rental option. If you have a painted porch, make sure that the power washer will not cause the paint to peel by testing in an inconspicuous area. Decorative wreaths aren’t just for Christmas time. Buying or making long-lasting wreaths or other door decor is a great way to embrace each season and express your personality. Try to avoid tacky door hangings and instead focus on finding wreaths with a timeless elegance that won’t look outdated after only a few years. I’ll be the first to say it: Plants make everything look better. 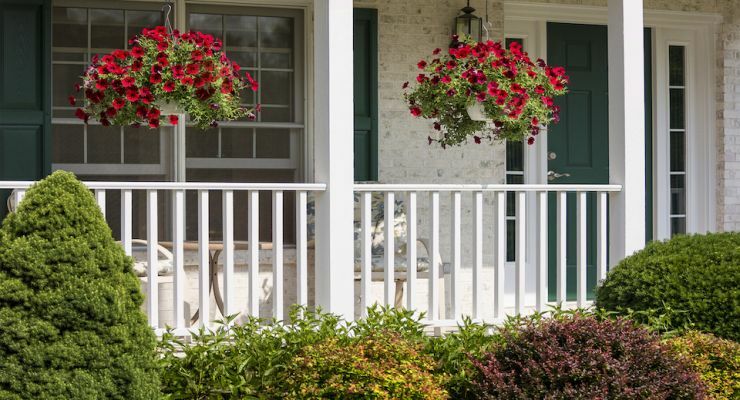 A full, vibrant hanging basket can transform your drab front stoop immediately. If you don’t have a good place to hang baskets, try placing potted floral arrangements on either side of the door. Be creative with the plants you choose. For instance, try planting an ornamental grass in the middle for some height and surrounding it with colorful annuals. Whether you have a drop mailbox by your front door or a traditional on-the-street box, it is probably due for a makeover. Your mailbox is often one of the first things that people see when they arrive at your home and should be a chance to show your style rather than merely a mail collector. Plant a flower bed around your mailbox in a square or a circle, paint the post to match your front door, or choose a hanging drop box that complements the other fixtures on your porch. For a more intensive mailbox makeover, you can swap out your existing box for something a little more eye-catching. Replacing your mailbox will be more time consuming than a simple facelift so be sure to allow at least a few hours of your day for this project. Usually, your eyes just skim over your porch light, and it isn’t traditionally thought of as something that sets the tone for the rest of your home. In reality, merely upgrading your lighting to something a little more modern or making sure to clean your existing fixture makes a massive difference to your front stoop. Buy a light that matches the other metals in your entranceway such as the railing or door handle. This can really work to tie the area together and revamp your porch decor. Do you know of any other easy ways to boost your home’s curb appeal? Let us know in the comments below! Hey Buddy!, I found this information for you: "7 Easy Ways to Give Your Home a Spring Facelift". Here is the website link: https://www.tropicalhealth.com/easy-ways-give-home-spring-facelift/. Thank you.